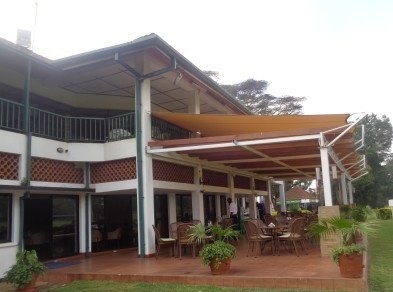 CarPort Design Shades in Kenya, Tanzania & Uganda. Tarpo is leading carport shades fabricator in East Africa. For over 40 years we have designed car park shades to protect your vehicle from all weather elements, i.e; rain, sun, and falling leaves. Our carport designs range from single bay solutions to large commercial building, at home compound, schools, airport, hospital, resorts offices, and retail centers. We do provide both 100% water-proof carport material and the 80% shadenet carport material. We have a list of car parking shade designs to choose from and we also offer customized designs according to your preference. With our range of car parking tent designs, you can rest your car in the shade, and enjoy that cool ride when you set off. Car shades protect your vehicle from the harmful direct sun rays, and shedding leaves. We provide a complete product that is ready for immediate use after installation, with the option to site management on damaged or already existing carport shades. 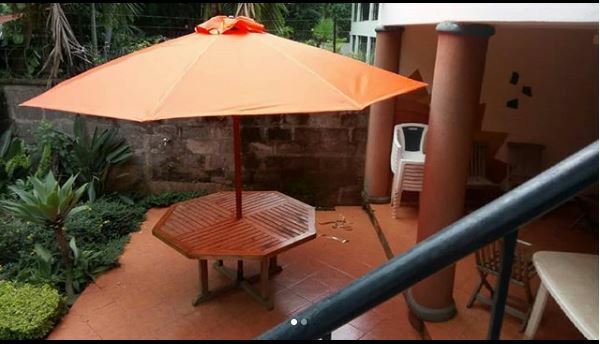 We are leading providers of car shades, canopies, sail shades, hotel shades and garden parasols in Kenya. Accentuate your office premises, or home parking with our diverse range of tensile structures, that come in a different fabric, color, and design. Design- Tarpo shades include canopies, parasol umbrellas, sail shades, and car parking shades. Our shades are skillfully designed to meet the standards of our quality management system. Before a project, we carefully survey the area and advise on the best design and have the right permits from city council when required. Fabric-We use the highest quality PVC fabric, acrylic canvas and 100% shade netting material for waterproof shades, and we also have options for 80% shadenet material. The carport fabric material come in various colors like green, blue, brick red, beige black and more. Durability- Generally this will depend on the fabric of choice and weather severity can vary from 4-7 years depending on top of this we offer excellent after-sale services. Prices - Discover high-quality shades at very affordable prices. A shade sail is a structure to create outdoor shade based on the basic technology as a ship's sail. Shade sails use a flexible membrane tensioned between several anchor points. While generally installed permanently, they are cheap and easy to set up. A sail shade is an affordable solution to place above public gathering places such as seating areas and playgrounds to protect people from strong sun radiation in the open sun which is dangerous due to sunburn and skin cancer risk. Our sail shades are high quality, our team of designers and engineers have continuously worked on improving the designs and understanding the needs behind these tensile structures to come up with very unique sail shade designs attached buildings and stand-alone sail shades. We use lightweight sail shade material e.g the shadenet and the acrylic canvas fabrics. The sail shade fabric can be 100% water-proof or 80% water-proof. Our sail shade come in different unique colors like green, blue, orange, red, wine-red and black. In East Africa, sail shades are commonly preferred as an affordable g- to for bar &restraut balcony shades. Restaurants' sail shade extends sitting space as well as provide shade and at the same time adorn the building making it stand out. 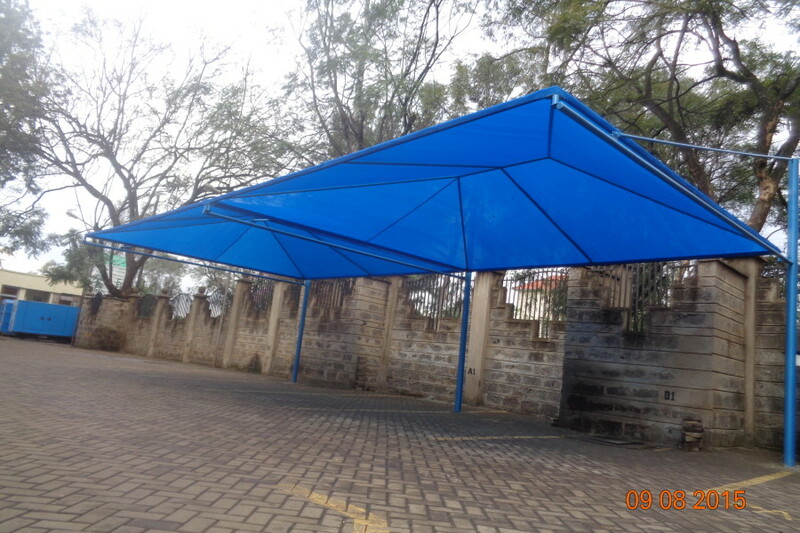 A canopy shade is an overhead roof structure with a fabric of choice covering it to provide shade or shelter from weather conditions such as sun, hail, leaves, and rain. Awnings and canopy shades come in all shapes, sizes, fabrics, and designs. Choosing the right material for your canopy shade involves more than just considering your budget. The type of material you use can save you in the long run. Some of the materials awning fabrics are made of include: PVC, Acrylic Canvas, ripstop canvas, and good Meta workmanship. We also design and install restaurants and bar canopy shades with an option of roll-able side curtains. Not to forget sidewalk canopies, entrance canopies and also in retail centers at any shopping center. Another type on canopies is the canopy shade tent used for exhibition stands and promotion.